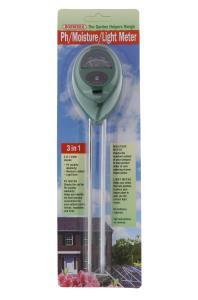 The PH-Moisture-Light Meter by Bosmere is a great 3 in 1 tool helps you identify and maintain the best growing environment for your home/garden plants, shrubs and trees. Check and keep the pH level (acidity/alkalinity) of your soil at optimum levels for your plants. The moisture meter helps prevent over/under watering and the light meter helps you select the best location for your plants light needs.